Responding to the need for easy-to-operate, easy-to-maintain products, Milgard developed the innovative SmartTouch® window lock and door handle. SmartTouch hardware is in the forefront of an important new trend in home design known as "aging in place." With so many baby boomers approaching their senior years, this technology and others are enabling people to live independently in their own homes longer and more comfortably. Milgard is committed to developing innovative products and solutions for this fast-growing market. Streamlined and Intuitive - The SmartTouch window lock mechanism is incorporated into the window sash for a sleek, low-profile design. It operates effortlessly. One smooth, single motion opens or closes the window, and locks it. No pinching, squeezing or twisting. Security at a Glance - SmartTouch offers peace of mind you can see. When the handle is down, the window is locked. When the handle is up, the window is unlocked. It’s easy to use for all ages and physical abilities. Stronger and 25% Better - The lock assembly is made from die-cast zinc so it's not only tough, it's built to last. Using AAMA certification testing guidelines, independent lab engineers demonstrated that the SmartTouch lock exceeds rigorous California forced-entry codes by 25%. The SmartTouch® window lock is available on Tuscany® Series, Trinsic™ Series and Essence Series® product lines. See your Milgard Certified dealer to review which operating styles is best for your needs. Not all operating styles offer a pull rail. Sleek and Ergonomic - The SmartTouch handle has a sleek, ergonomic design and hidden lock mechanism. A simple one-touch motion unlocks, opens and closes the door, making it accessible and usable for all ages. Exceeds Forced-Entry Codes - The SmartTouch handle's lock and grip combination exceeds all California forced-entry requirements, which are among the most rigorous in the nation. In 2014, Milgard introduced a secondary lock for patio doors --- an industry first. SmartTouch® Bolt is a fully integrated steel bolt that secures the sliding patio door firmly into the top frame with the flip of a lever. As an added benefit, SmartTouch Bolt can let the fresh air in while keeping the door secure in a vented position. 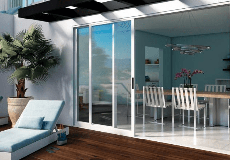 The SmartTouch® bolt is available on Tuscany® Series and Essence Series® sliding doors. * Designed to improve security and are not guaranteed to keep intruders out under all circumstances.